The last round of the World Team Chess Championships produced a scenario of rare intensity, as team and individual medals were decided in the last minutes. Both gold medals had already attributed one day before the end to Russia in the open section and China in the women section, and both teams were involved in crucial matches for the podium. In an epic battle against India, the Russian seemed on the verge of losing, before Ian Nepomniachtchi eventually saved his position to a draw and Alexander Grischuk won his game. With this 2,5-1,5 loss, India unluckily had to cede the bronze medal to China, which overcame Kazakhstan by a thread. The silver medal went to England, which convincingly beat Sweden. All results, final rankings and individual medal awards can be found at http://wteams.astana2019.fide.com/en/elementor-6833/. The bilingual press conference with the Russian team can be viewed at https://www.youtube.com/watch?v=ocYVFO_p8co. Both local teams performed slightly above expectations. The men’s team had a tough tournament but ended on a positive 8th place. Team leader Rinat Jumabayev was the real hero with a tremendous 5 out of 9 score. The women team reached their initial goal, a 5th place just behind the big-4. It is clear that this ambitious young team is promised to a bright future. Zhensaya Abdumalik speaks about the tournament at https://www.youtube.com/watch?v=DLk836Pw7V4. The whole event proceeded smoothly and was organized at a very high level. The Astana International Financial Centre, partner of the World Championship, offered a perfect venue. The general sponsor ERG and the general Samruk Kazyna greatly contributed to the success of the World Team Championship. Please visit official website for complete results, board prizes, videos and more. 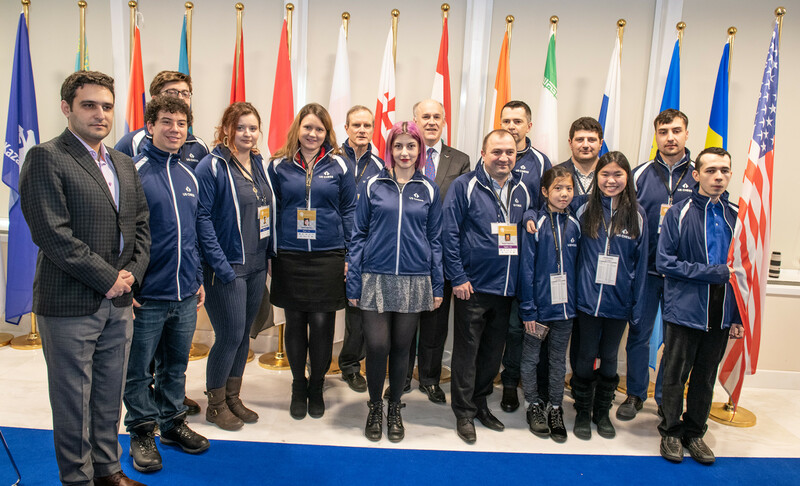 World Team Chess Championships 2019 is over. FIDE publishes the final ranking of Teams after Round 9 which concluded in Astana, Kazakhstan on March, 14 2019. It had been predicted, the Chinese women secured the gold medal today by winning their match convincingly. The real surprise occurred later in this eighth round, when all results in the open section coincided to grant the gold medal to the Russian team. Thus, both winners stand one round before the end. The decision in the match China-United States of America fell on boards 1 and 3, when serial winners Tan Zhongyi and Lei Tingjie used their white pieces to win their games. China needed a win to get the gold medal one round before the end, they confidently achieved it with a 3-1 victory. The fight for both other places on the podium is still open between Russia, Ukraine and Georgia. All results and ranking can be found at http://wteams.astana2019.fide.com/en/elementor-6842/ . The press conference with the Chinese captain Yu Shaoteng and some players took place right after their victory and can be viewed at https://www.youtube.com/watch?v=9Rjg0AHQ2mI . The scenario of the open section was less predictable. True, the Russians left no chance to the Swedish team and confidently won 3,5-0,5. But it was clear they would not win gold on this day without external help. China trounced England 3-1 and is finally recovering from its bad start. The Chinese currently occupy the fourth place, one point behind their victim of the day and India, which was lucky to escape with a draw against the US team. The fight for both remaining medals will be fierce, as can be observed at http://wteams.astana2019.fide.com/en/elementor-6833/. In view of the late outcome of the matches in the open section, and in order to secure the highest possible audience, the organizers decided to stage the title press conference with the entire Russian team on Friday at 16:00 local time. It will be broadcast live on the official website. In case, one or more games still run, the press conference will be slightly postponed accordingly. Please pay attention to the fact that the final round will start earlier than usual, at noon in the Astana International Financial Centre. Live commentary in English and Russian can be followed at http://kazchess.kz/world_astana2019/. Before narrating the chess highlights of the round, it seems appropriate to stress that the organization of a prestigious event as the World Team Chess Championships is not self-evident. It would not take place without the financial support of general sponsor ERG, general partner Samruk Kazyna and partner the AIFC. Both tournaments are slowly reaching a climax. The seventh round did not produce any real surprise, meaning that the leaders keep control of their dominating positions. Most matches were very close, especially in the open section. Russia had a hard time overcoming the United States of America, but eventually secured victory thanks to Vladislav Artemyev on board 4. Here are his post-game impressions in Russian - https://www.youtube.com/watch?v=ms3AZYgsxIk . England edged out Egypt and moved to sole second place, after India drew against Azerbaijan. The English captain Malcolm Pein nevertheless remains cautious as to their chances of medal - https://www.youtube.com/watch?v=P62h0wRA3sc . Details on results and ranking can be found at http://wteams.astana2019.fide.com/en/elementor-6833/ . The main match of the women section was clearly the fight for the podium between Russia and Ukraine. Decisive results were achieved on the first two boards. Mariya Muzychuk won a good game for Ukraine against Kateryna Lagno, which she relates in a press conference [ https://www.youtube.com/watch?v=bnW4Ac0m3U4 ]. Alexandra Kosteniuk levelled the score against Anna Muzychuk, while both other games were drawn, thus sealing the 2-2 score. Georgia left no chance to the host country and won 3,5-0,5. They catch up Ukraine on shared third place. China won easily against Egypt and has a chance to clinch the gold medal one round before the end, in case of a victory against the US team in round 8. All other results and current standing are available on the official website - http://wteams.astana2019.fide.com/en/elementor-6842/ . The eighth round will start on Wednesday March 13th at 3 pm in the Astana International Financial Centre. Live commentary in English and Russian can be followed at http://kazchess.kz/world_astana2019/ . A free day in chess is never easy to deal with. Players in good shape risk getting out of rhythm, whereas players in bad shape meditate endlessly on their misfortune. In other words, a surprise is likely to happen. https://www.youtube.com/watch?v=JfHaZmGC3Ik . The equalizer was scored by Arkady Naiditsch, who inflicted a painful second defeat in a row to Sergey Karjakin on board 1. You will certainly appreciate his sense of humour in the post-match interview https://www.youtube.com/watch?v=PPnCYbSUZJc . Adly won a very instructive game which he comments in a press conference https://www.youtube.com/watch?v=IAm9qULtqSc . Almost all matches in the women section ended in close victories for the favourites, so that China maintains its perfect score. “Miss 100%” aka Alexandra Goryachkina scored the decisive point for her team, and gives her impression in an short interview in Russian https://www.youtube.com/watch?v=BxHvPfW7Ujg . All individual results and current ranking can be found at http://wteams.astana2019.fide.com/en/elementor-6842/ . The seventh round will start on Tuesday March 12th at 3 pm in the Astana International Financial Centre. Live commentary in English and Russian can be followed at http://kazchess.kz/world_astana2019/ . The fifth and last round before the free day produces a key result in the women section, as China wins the top match against Russia. A small sensation occurs in the open section, as the leader of the Kazakh team Rinat Jumabayev beats Sergey Karjakin. This does not prevent Russia to claim the match and top the standings. Both Chinese teams seem to be in completely different shape in Astana. Whereas men struggle in the middle of the rankings, despite their close victory against Iran today, the female representatives are on fire. They made short work of their top encounter against Russia. Tan Zhongyi left no chance to Kateryna Lagno on board one, thanks to a clever pawn sacrifice which paved the way to a strong attack. China’s other white game went equally successfully, as Lei Tingjie outplayed and eventually mated Valentina Gunina. Russia did not quite show the same efficiency with the white pieces. Alexandra Kosteniuk struggled against Huang Qian and was forced to accept a generous draw offer by her opponent, thus sealing the fate of the match. After a long game, Alexandra Goryachkina managed to limit the damage by beating Ding Yixin. This victory lifts her personal score to an impressive 5 out of 5. 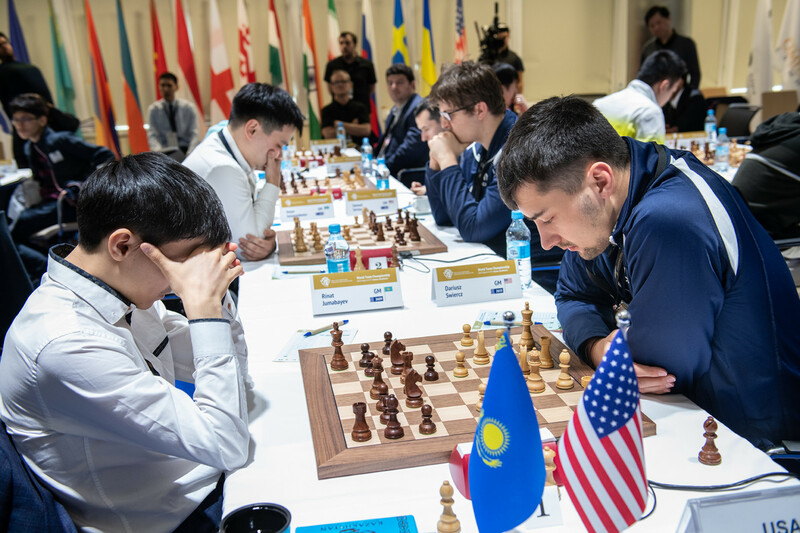 As can be seen in the actual standings at http://wteams.astana2019.fide.com/en/elementor-6842/, Ukraine was held to a draw by the young Kazakh team and occupies the third place. In the men’s section, Russia confidently defeated Kazakhstan 3-1. 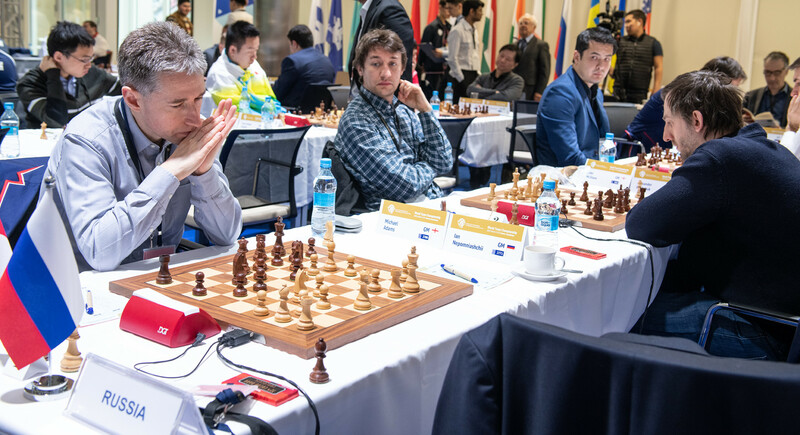 The only point for the local team was scored by Rinat Jumabayev against the former World Championship finalist Sergey Karjakin. As explained in the press conference, the grandmaster from Shymkent steadily amounted pressure until his opponent, famously nicknamed the Russian Minister of Defence, uncharacteristically made the decisive mistake. Three teams are involved in a battle for the second place. England and India played a tense match which ended 2-2, while the United States of America missed a good opportunity to overtake them. Facing the off-form Azeri team, indeed, they stumbled and lost 3-1. In the last match of the day, Sweden scored its second consecutive win against Egypt. 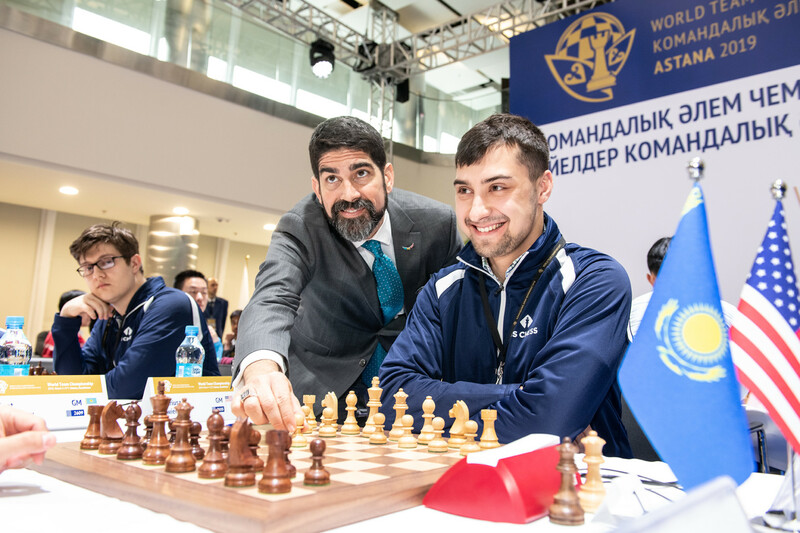 All details about results and current standings can be found at http://wteams.astana2019.fide.com/en/elementor-6833/ . All teams are looking forward to a well-deserved break on Sunday. Participants will be driven around to visit the capital of Kazakhstan. The tournament will resume on Monday March 11th at 3 pm in the Astana International Financial Centre. Live commentary of the 6th round in English and Russian can be followed at http://kazchess.kz/world_astana2019/ . Plenty of things happened today at the Astana International Financial Centre, at and besides the chess board. Russia and China cruise through in the women section, while all leading teams drew in the open section. But let’s start our report by the famous “Ladies first!” The organizers celebrated women’s day by exhibiting a large bunch of roses, from which every female participant could chose to take a piece. The youngest participant of the event, American Rochelle Wu, celebrated her 13th birthday today. She received a present which will remain as a nice souvenir of her trip to Kazakhstan. 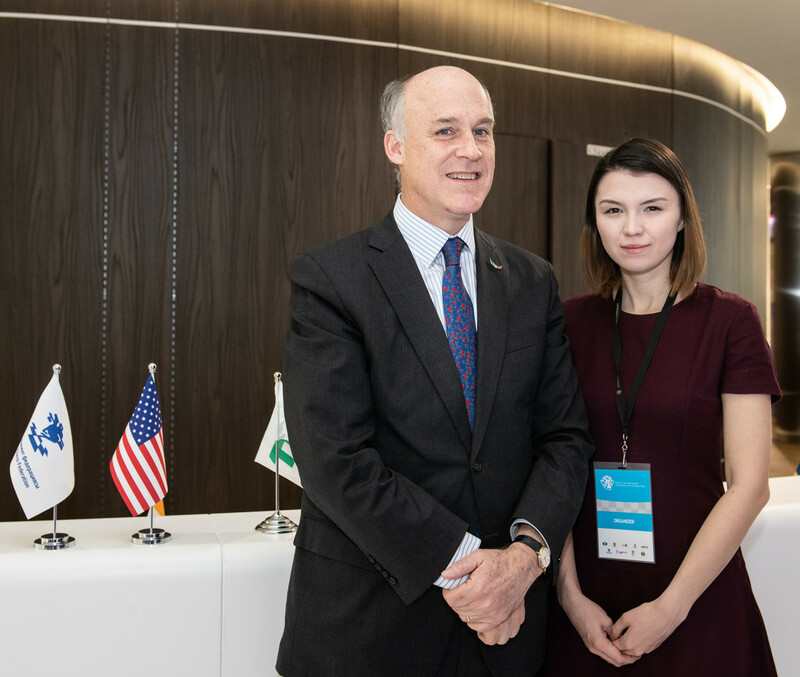 The start of the 4th round was marked by the visit of Deputy Chief of Mission Theodore Lyng and other representatives of the US embassy in Astana. 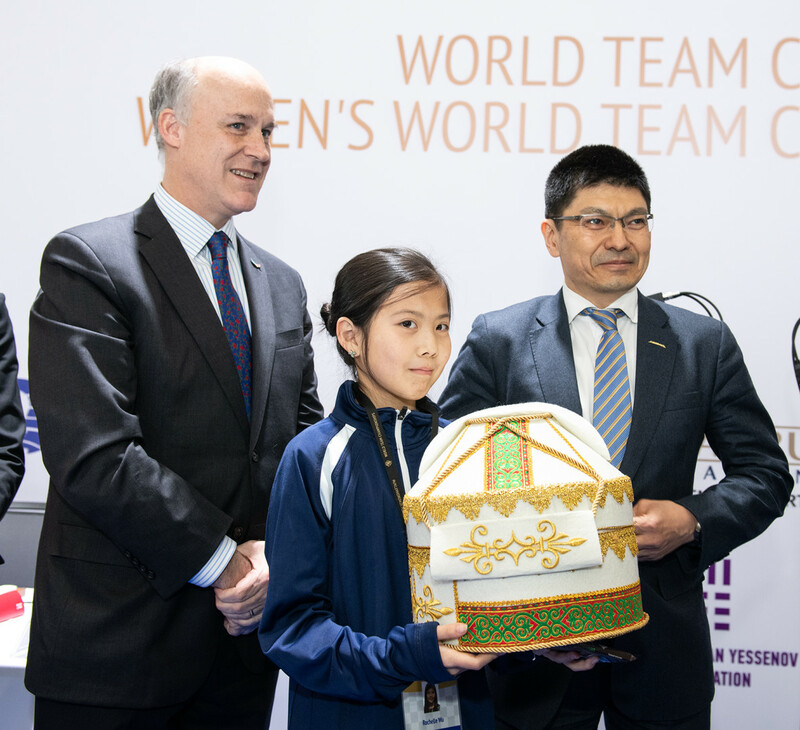 A special account of this event has already been published at wteams.astana2019.fide.com. As a coincidence, both encounters between the United States of America and Kazakhstan took place today. The Kazakh ladies rose to the occasion and scored their first match victory, whereas the men’s encounter ended in a draw. 2-2 was actually the score of both other top matches in the open section, Russia-England and India-China. Thus, nothing changed at the top of the standings. Bottom seed Sweden celebrated a first victory by dominating Azerbaijan 3-1, and Iran won on the same score against Egypt. You will find all individual results and the standings at wteams.astana2019.fide.com. As expected, Russia and China dominate the women section and have won all their matches. All eyes will be turned to their direct encounter tomorrow! The top match of the day between Georgia and Ukraine was hard-fought and eventually tied, which means that Ukraine still occupies the 3rd place. Finally, Hungary had trouble beating Egypt and eventually did so by the smallest margin. More details are available at wteams.astana2019.fide.com. The third round of the World Team Championships in Astana features the most anticipated encounter in the whole open section. Both teams with a rating average over 2700 face each other in a duel which may already turn out to be decisive. How would China react after yesterday’s defeat against the United States? Would they try and strike back immediately or rather play it safe? It is actually hard to guess the pre match strategy of each team, but Russia clearly seemed to pin their hope on their white boards. Indeed, Ian Nepomniachtchi is always dangerous in such crucial matches and young rising star Vladislav Artemiev has scored 2 wins so far. This proved very effective, as Nepomniachtchi managed to put Yu Yangyi under unpleasant pressure and eventually won within less than 3 hours. Artemiev also stood better at the start but then committed a mistake which put him in danger. But his class and composure allowed him to save the game despite being a knight down. For more details about his game, you may want to listen to his thorough after-game analysis on the YouTube channel of FIDE. The Chinese did not manage to create serious problems on their own white boards, so that Sergey Karjakin and Alexander Grischuk comfortably held against Ding Liren and Wei Yi. With this second loss, it is clear that China will hardly be in contention for the gold medal anymore. As England and the United States of America tied 2-2, Russia is now the sole leader of the open section. India moves to joint second thanks to a large win against Egypt, whereas Kazakhstan is 6th after a good draw against Azerbaijan. All individual results and standings of the open section can be found at wteams.astana2019.fide.com. There were no big clash in the women’s section and the favourites overcame this 3rd round with a victory. The young Kazakh team fought valiantly against China but eventually lost by a thread. Lei Tingjie explains her nice victory at FIDE Youtube channel. Russia and China are still in the lead with a perfect score, ahead of the Ukraine. All results and standings are available on the tournament website. The fourth round will start on Wednesday March 8th at 3 pm in the Astana International Financial Centre. Live commentary in English and Russian can be followed at kazchess.kz/world_astana2019. The second round of the World Team Championships produces a major upset, as the American men’s team beats China. This result leads to a complete redistribution of roles before the big match China-Russia on Thursday. A Team World Championship usually means that several teams have to travel around the globe to reach the host country. This event is no exception, some players may find it difficult to take their mark. The Egyptian teams for instance have to adjust to a radical climate difference, and so far both had basically no chance against stronger opponents. In the second round, the men’s team lost 3-1 against Russia, while the women suffered their second 4-0, this time against the Ukraine. It is true that India is not favoured either by the cold weather in Astana. 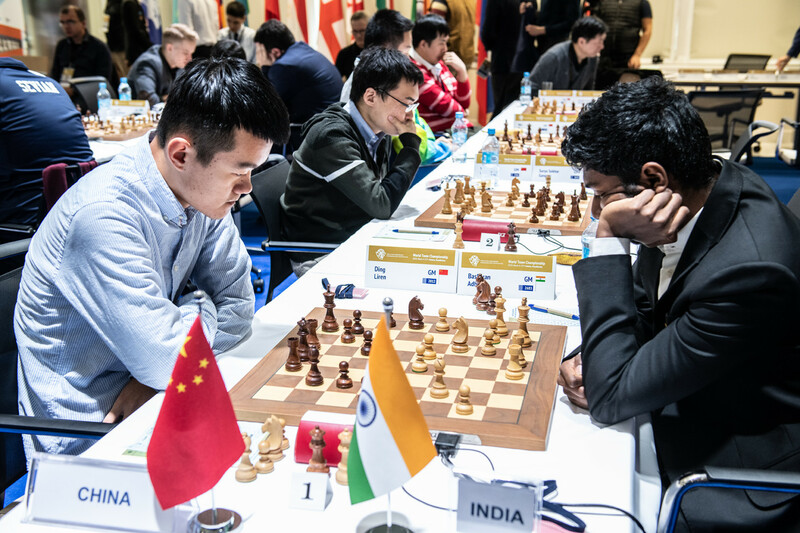 However, as Adhiban Baskaran noted in his after-game interview, most of his teammates came directly from the Aeroflot Open in Moscow and therefore got used to freezing temperatures beforehand. 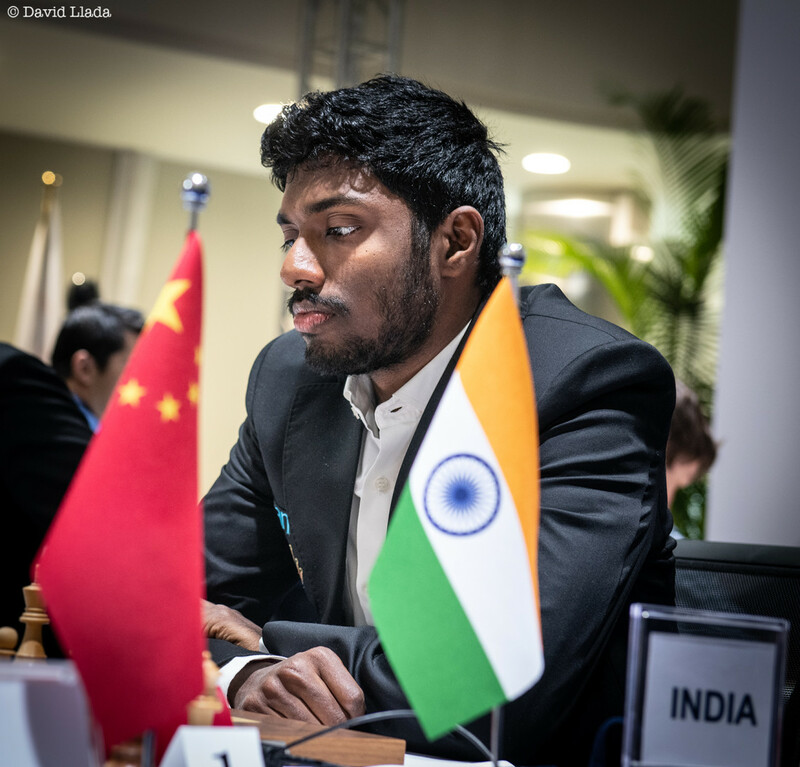 The Indian leader won a good game against the junior World Champion Parham Maghsoodloo, but his team had to settle for a draw with Iran. Speaking about adjustment, jet lag is clearly an issue for players from the United States of America. Yet, they do not seem to feel any effect and created a huge surprise in the second round by defeating China 2,5-1,5. Aleksandr Lenderman won his game on board 4 against Ni Hua, whereas the other encounters ended in a draw. 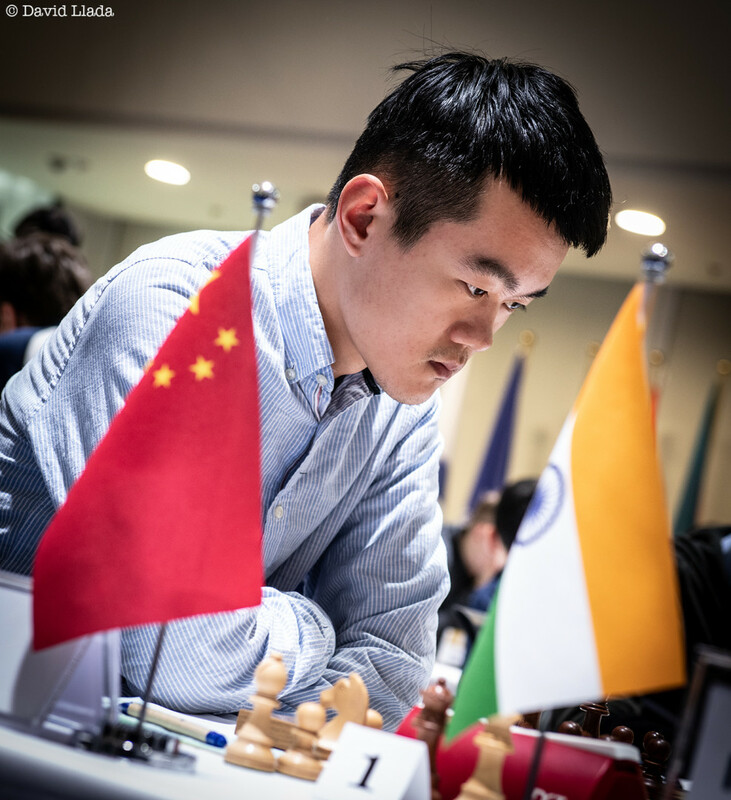 The last game to finish was particularly tragic, as Wei Yi missed several chances to decide the game in his favour against Alexander Onischuk. The match winner gives his impressions at https://www.youtube.com/watch?v=KlXIITgWA28. The United States of America has scored two victories so far, as Russia and England, who overcame Azerbaijan 2,5-1,5. In the fifth match of the day, Kazakhstan pleased their fans thanks to a comfortable 3-1 against Sweden. The star match of the day in the women’s section featured China against Georgia. Even though both teams do not compete in their optimal line-up in Astana, they represent hot contenders for the medal. 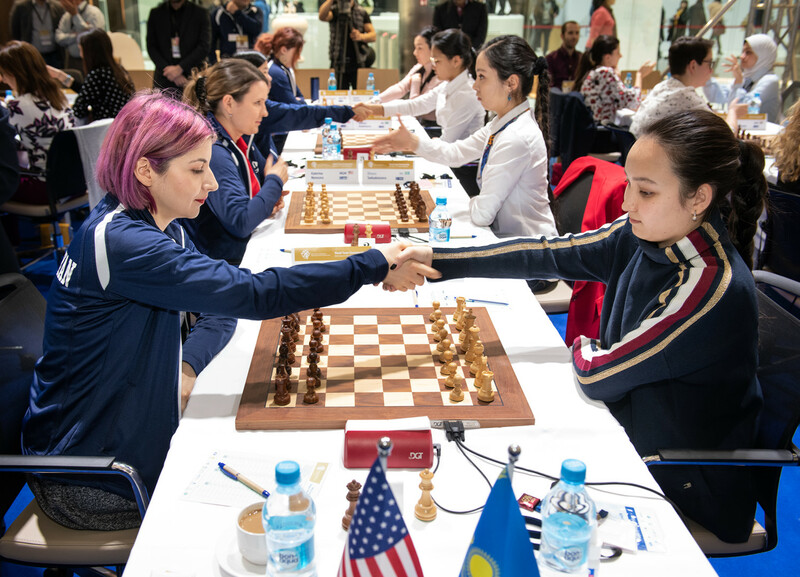 Former women world champion Tan Zhongyi scored the decisive win on board one against Bela Khotenashvili, when all other games had previously been drawn. They thus lead together with Russia, who scored a large 3,5-0,5 victory against Armenia. The young US team beat Hungary 3-1, while India got slightly lucky to escape with a draw against Kazakhstan, as Zhansaya Abdumalik explains in her interview. All videos and livestreams can be viewed on the FIDE YouTube channel. The program of the third round promises two breathtaking matches in the open section, Russia-China and England-USA. In the encounter between both rating favourites of the event, the Chinese team might already consider this encounter as a last chance to fight for the gold medal. Games start on Thursady March 7th at 3 pm. Live commentary can be followed in English and Russian on the official website. The most prestigious team event in 2019 has been launched today in Astana. FIDE President Arkady Dvorkovich played the symbolic starting move in the match between Russia and the host nation Kazakhstan. All main favourites prevailed in both sections, and only minor upsets occurred in the first round. 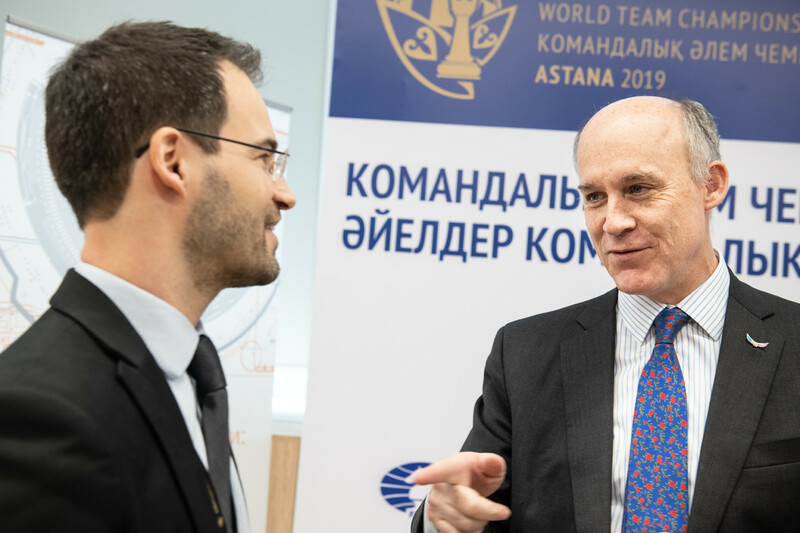 The Astana International Financial Centre World Team has opened its doors to the World Team Championships 2019. This impressive modern complex has been inaugurated in July 2018 and is perfectly suited to host an event of such dimension. FIDE President Arkady Dvorkovich symbolically executed the first move on behalf on his fellow countrywoman Kateryna Lagno in her game against Zhansaya Abdumalik. This match had been announced as the highlight of the first round in the women section, and it definitely kept its promises. The young and ambitious Kazakh team maintained the tension until the fourth hour of play. The key game was certainly the one launched by the FIDE President. 19-year old Abdumalik had the women blitz world champion from Russia on the ropes, but let her advantageous position go out of control and eventually lost. 3-1 is a harsh score, but this defeat will certainly serve as a valuable experience. The other favourite, China, comfortably won 3,5-0,5 against Hungary, whereas India and Georgia tied their match. The only real shock of the day was the 2-2 garnered by the United States of America against the experienced Ukrainian team. And it could even have been better, had the young Rochelle Wu converted her winning position at the very end of the game. The preview of the open section announced a duel for the first place between China and Russia. Both teams fulfilled their duty by winning their respective matches. In the absence of their two leaders Mamedyarov and Radjabov, Azerbaijan never really stood a chance and lost 3,5-0,5 to China. The Russian had the tricky task to start against the talented Iranian team, but they scored a solid 2,5-1,5 victory. Vladislav Artemiev celebrated his first selection in his national team on his 21st birthday with a smooth win! England won a close match against Kazakhstan despite the unexpected defeat of their leader Michael Adams against Rinat Jumabayev. In the other two matches of the day, the United States of America beat Egypt 3-1, and India defeated Sweden 3,5-0,5. The opening ceremony took place on March 4th in the evening at the Hilton Astana hotel. FIDE President Arkady Dvorkovich and the President of the Kazakhstan Chess Federation officially launched the World Team Championships and praised the whole organizing team for successfully staging this event at such short notice. The program of the opening ceremony was livened up by a colourful performance of the Khazar musical group and by the gifted young singer Danelia Tuleshova. It culminated in the drawing of lots, which set the program of rounds for the whole tournament. No big clash will occur in either section of the starting round. In the women’s tournament, most of the attention will be drawn to the match Russia vs Kazakhstan. The title-holder will have to beware of the young local team! The other matches will feature India-Georgia, Armenia-Egypt, China-Hungary and United States-Ukraine. Same kind of dangerous start for the Russian men’s team against the talented squad of Iranian youngsters, led by the junior world champion. In the remaining matches, China and India should be favourite against Azerbaijan and Sweden respectively, while Egypt-United States and England-Kazakhstan seem more balanced. The first round will start at 3 pm on March 5. FIDE President Arkady Dvorkovich will make the first move, after which he will join a press conference. The organizers of the World Team Chess Championships 2019 held a press conference on the eve of the tournament. Several personalities like Head of Kazakhstan sports Serik Sapiyev or former vice-World champion GM Sergej Karjakin answered the questions of around 50 journalists. The World Team Championships for men and women are taking place from March 4 – 15 in Astana. The Kazakhstan capital is used to staging events of such magnitude, but Tournament Director and Vice-President of the Kazakhstan Chess Federation Zhandos Abishev admits that “organizing everything in only 5 weeks was a real challenge, but all is ready just in time. We would never have been able to make it without the support from our partners, namely our general sponsor ERG, our general partner Samruk-Kazyna, our social partner Samruk-Kazyna Trust and our partner AIFC”. Serik Sapiyev adds that “the popularity of chess has been continuously increasing in the past years. Prestigious events like this World Championship contribute to the further promotion of chess in Kazakhstan”. Ten teams will face each other in both sections. The leader of the Kazakh women’s team Zhansaya Abdumalik believes that “Kazakhstan can achieve something very special here. Russia, China and the Ukraine are certainly favourite, but the gap with other teams is quite small, so that anything can happen”. Sergej Karjakin has fond memories of Astana. “It is a lucky place for me, as I became the World Champion in rapid chess here in 2012 and took bronze in the blitz. We have a very compact team and I hope that we will all be in good shape”. The opening ceremony with the drawing of lots is taking place on March 4 at 7 pm at the Hilton Astana Hotel. On March 5 at 3 pm, FIDE President Arkady Dvorkovich will launch the tournament and the pieces will start moving on the battlefields.